Beat butter with sugar until creamy. Add 1 egg and 1/4 cup almond powder and mix. Add the second egg and the remaining almond powder and mix until well combined. Roll out the puff pastry. Cut out two circles of about 10″ in diameter. Cover one layer with the filling leaving about 1″ from the edge. Beat the third egg and coat the edge of the pastry with the beaten egg. Place the second circle of puff pastry over the filling and pinch the edge to seal. With the tip of a sharp knife, prick the top of the pastry in three spots (but not in the middle). Score a pattern of your choice over the top of the pastry. 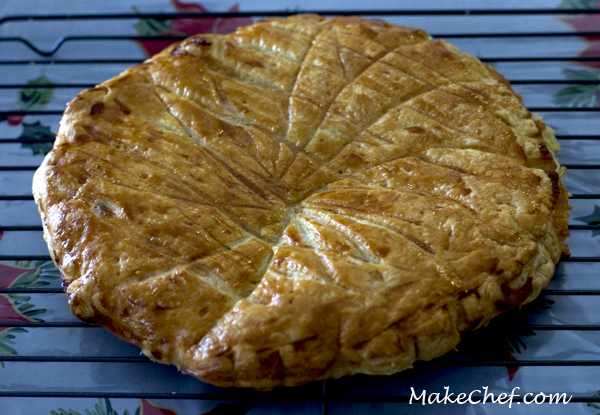 Brush the galette with the remaining beaten egg.